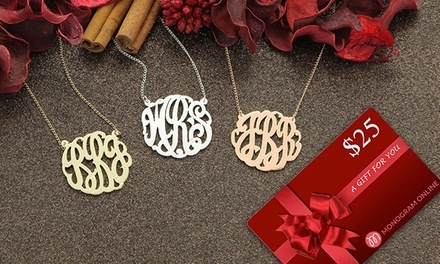 Monogram Necklace With a $25 Gift Card from Monogram Online (Up to 73% Off). Three Options Available. Engraving initials into a necklace makes for a beautiful gift and is much more practical than embroidering them onto all your shirts. That's your name, don't wear it out with this Groupon.